Christian Atsu remains the only Newcastle United signing so far this summer. Picture by Frank Reid. Newcastle United’s search for a second summer signing is set to drag on into next week – as the clock ticks down on the start of pre-season training. The club has signed only one player – winger Christian Atsu – so far this summer. Owner Mike Ashley pledged to back Rafa Benitez with “every penny” the club generated through promotion last month. 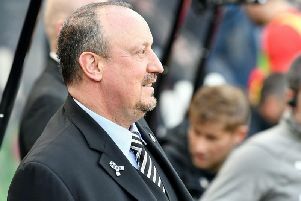 And Benitez was keen to see several new faces arrive at St James’s Park before the start of pre-season training on July 3. But progress in the transfer market has been slow up to now. Newcastle’s recruitment efforts are set against the backdrop of discussions with overseas investors about a full or partial sale of the club, which parted company with chief scout Graham Carr this week. Benitez wants to sign Eibar defender Florian Lejeune, who could cost £8.8million. However, any deal for Lejeune is not expected to be completed this week. The club was yesterday strongly linked with an £5million move for Manchester City midfielder Fernando. Fernando is a player United have considered, but the club has not firmed up its interest in the 29-year-old. Newcastle are also set to lose out on Chelsea striker Tammy Abraham, who is set to join Premier League rivals Swansea City on a season-long loan. Meanwhile, United will travel to Germany in pre-season. Benitez’s side will take on VfL Wolfsburg on Wednesday, August 2. The game will be staged at the AOK Stadion, the home of the Bundesliga club’s development and women’s teams, with a 4pm kick-off, local time. Newcastle are close to finalising a second warm-up fixture in Germany. United have previously announced fixtures against Heart of Midlothian (July 14), Preston North End (July 22) and Bradford City (July 26).